It is the thought itself that birds are a seemingly harmless group of creatures that allows for bird infestations to affect peoples’ property and possessions. Although many people don’t immediately notice how birds influence us so much, there are very clear consequences that arise when they are left uncontrolled and unchecked. The most notable of these are bird droppings. Bird droppings consist of very acidic elements that have a detrimental effect on the surfaces that they make contact with. The acid slowly causes corrosion and deterioration of roof materials, as well as paint (including vehicle paint), air conditioners and other machinery. The after effects of this corrosion are leaks, damage and even complete structural failures. Furthermore, as birds build their nests in rain gutters and roof drains, additional stress is placed on the fluid performance of these systems and on their structural integrities. Even the nesting materials that birds use, which are usually made up of straw and twigs, are hazardous in large quantities because they are very flammable. When birds choose to nest near an electrical box or any other form of electrical equipment, there is an inherent risk of danger involved. Even when choosing to nest in less dangerous areas like chimneys and vents, birds still cause danger by restricting airflow and by spreading germs. Birds may appear to be generally inane and cute creatures but they are known to carry harmful and dangerous diseases that can spread to people if there is no control. There is a major health factor with any type of animal that is not kept in check. Noise can also become an increasing concern when it comes to large groups of birds. Uncontrolled, they could grow to become very distracting and influence property values. Abundant bird droppings around a building are a signal of an unkempt and uncared for area—and this is especially damaging for businesses and property owners. We care about animal welfare and our goal is help treat the problems caused by these animals in the most humane and effective ways possible. 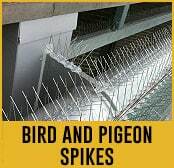 When it comes to controlling them and their behaviour, we recommend the use of bird spikes and pigeon spikes. Bird spikes are an excellent way to deter birds from nesting on, and indeed landing on, surfaces. These pigeon spikes are normally made up of a plastic base and several upward- and outward-pointing metal spikes. The base is constructed in such as a way that it can easily be attached to any surface by being glued, nailed or screwed down. They are created in a vast range of sizes to accommodate the need for both small gutters and for large roofs. Our intention is to tailor our solutions to your individual circumstance and to solve the infestation using the best tools. Bird spikes are regarded by the UK’s Royal Society for the Protection of Birds as one of the most useful deterrents for birds. Birds are not directly harmed either because the spikes are designed to simply make it harder to land and nest. Another approach that we offer is bird & pigeon proofing post & wire. Bird & pigeon proofing post & wire is a way of creating a barrier that prevents birds from entering an area. Resilient to damage, two posts are set up, by being glued, nailed or screwed down, and are connected together with shock-absorbing wires. These simple and effective systems can be used almost anywhere, and we are always here to help you choose the best methods of bird control.